A 55-year-old man who smokes is as likely to die in the next 10 years as a 65-year-old who has never smoked. Less than 1 woman in 1,000 younger than 50 will die in the next decade from cervical cancer. A 35-year-old nonsmoking man is five times as likely to die in an accident before 45 as he is to die of heart disease, and a 35-year-old woman is twice as likely to die accidentally by 45 as she is to die from breast cancer. Why is Denver International Airport The Only Colorado Airport Allowing Indoor Smoking? are free of secondhand tobacco smoke. And the state’s casinos went smoke-free on New Year’s Day 2008! 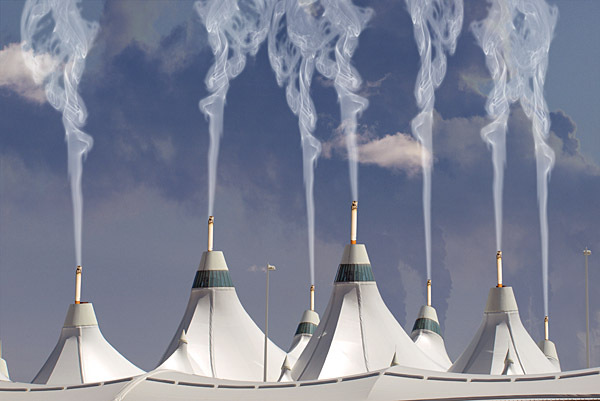 However, Denver International Airport, the state’s only remaining exempted public workplace, continues to expose workers and travelers who patronize designated “smoking lounges” – exclusively contracted bar and restaurant establishments – to the health risks posed by secondhand tobacco smoke. Denver’s old Stapleton International Airport was set to go smoke-free per the original version of Executive Order 99 issued by former Mayor Federico Pena in 1990. DIA was to be smoke-free as well. However, Executive Order 99 was stayed, and eventually amended in 1993, enabling construction of two “smoking lounge” concessions (now four) at DIA. Tobacco industry documents released as a part of the omnibus 1998 Tobacco Master Settlement Agreement clearly indicate the pro-smoking “public opinion,” as well as the two “smoking lounges” permitted via exclusive city contract, were bought and paid for by Big Tobacco. Secondhand tobacco smoke exposure causes approximately 53,800 deaths per year in the U.S. This number is based on the midpoint numbers for heart disease deaths (48,500), lung cancer deaths (3,000), and SIDS deaths (2,300). The Environmental Protection Agency has found that fine particulate air pollutants can penetrate deeply into the lungs and have serious health effects, including increased respiratory symptoms and disease, decreased lung function, and alterations in lung tissue and structure. The 2006 Surgeon General’s Report on The Health Consequences of Involuntary Exposure to Tobacco Smoke confirmed the known health effects of secondhand smoke exposure, including immediate adverse effects on the cardiovascular system, and coronary heart disease and lung cancer. The report concluded that there is no safe level of exposure to secondhand smoke and that establishing smokefree environments is the only proven way to prevent exposure. The report also finds that many millions of Americans are still exposed to secondhand smoke despite substantial progress in tobacco control. What’s Contained in Secondhand Tobacco Smoke? According to the Centers for Disease Control, tobacco smoke is a complex mixture of gases and particles that includes smoke from the burning cigarette, cigar, or pipe tip (sidestream smoke) and exhaled mainstream smoke. Secondhand smoke contains at least 250 chemicals known to be toxic, including more than 50 that can cause cancer. A 1992 Environmental Protection Agency report, Respiratory Health Effects of Passive Smoking, provides a list of a few of the 4,000 chemicals and substances in secondhand smoke, several of which are cancer causing agents, including: benzene, 2-napthylamine, 4-aminobiphenyl, nickel, polonium 210 (radioactive), nitrogen oxides, N-nitrosodimethylamine, N-nitrosodiethylamine, N-nitrosopyrrolidine , 1,3-butadiene, analine, formaldehyde, hydrazine, N-nitrodiethanolamine, cadmium, benzo[a]pyrene, benz[a]anthracene, Y-butyrolactone, particulate matter, N-nitrosonornicotine, NNK, carbon monoxide, carbon dioxide, carbonyl sulfide, toluene, acrolein, acetone, pyridine,3-methylpyridine, 3-vinylpyridine, hydrogen cyanide, ammonia, methylamine, dimethylamine, nicotine, anatabine, phenol, catechol, hydorquinone, cholesterol, quinoline, Harman, zinc, benzoic acid, lactic acid , glycolic acid, succinic acit, PCDDs and PCDFs (Dioxins, Dibenzofurans), formic acid, acetic acid, and methyl chloride.